January 28, 2014 March 14, 2014 filipinocavedivers Cool Stuff! The media are full of stories of diver(s) surfacing from a dive only to find out that the dive boat is gone. Some cases have been presumed fatal; some tell of horror stories – being adrift anywhere from one to 19 hours. Back-mounted tanks are fixed flush against the body and can easily get tilted back in the lying position.This will do for drifting of hours duration. Sidemount is different. 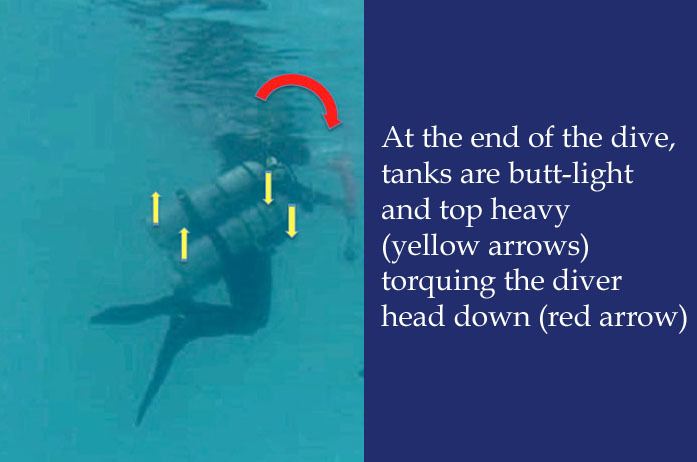 The tanks are loosely hanging on the sides of the diver away from the diver’s center of gravity and act more freely in tilting bottom-up towards the end of the dive when the tanks are half-empty. 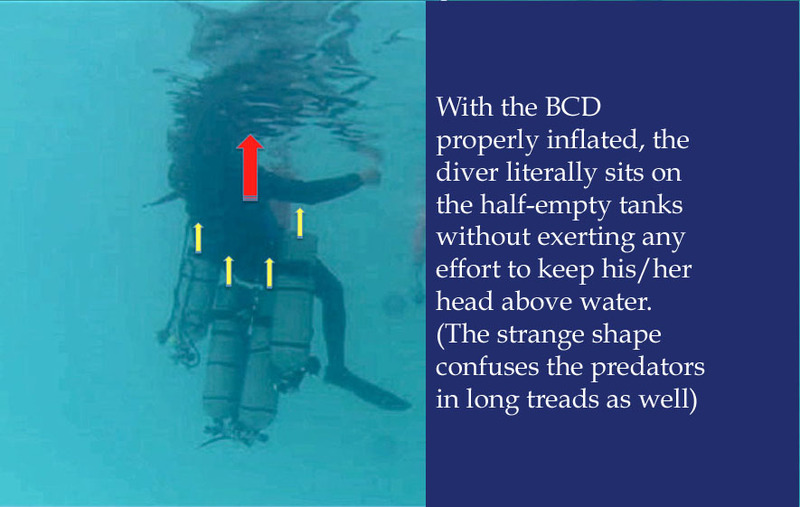 This gives the collective effect of tilting the diver’s head down into the water. Figure 1 below illustrates the problem. Fig 1. The forces at the end of the dive on sidemounts (tanks are half empty). Treading water in this configuration can easily lead to exhaustion and its dire consequences in a relatively short period of time. Fig 2. The sequence of tank drops are: a) back tanks, right to left; and b) front tanks, right to left. Note the absence of hanging hoses. All hoses are stowed back except for the long hose (primary tank, right) whose second stage remains clipped to the chest D-ring in case the need for regulator breathing arises. Thank God All Divers Live LONG!